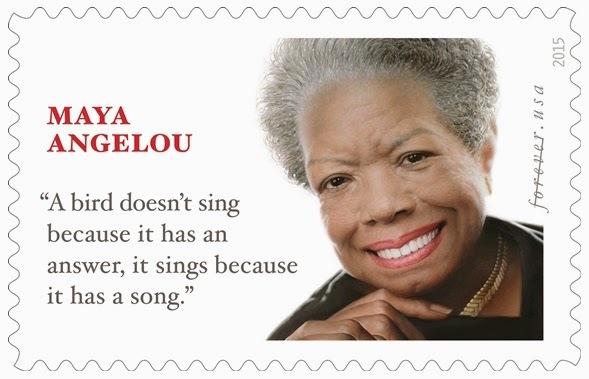 USPS unveiled the Dr. Maya Angelou Forever Stamp image today on March 4, 2015, and announced that the stamp's First-Day-of-Issue as April 7, 2015 with the dedication ceremony at the Warner Theater in Washington, DC. Maya Angelou (April 4, 1928 – May 28, 2014) was an American author, poet, dancer, actress, singer, and champion of civil rights. One of the most dynamic voices in 20th-century American literature, she was known for her series of autobiographies. The first of the seven in the series, “I Know Why the Caged Bird Sings” published in 1969, gave a vivid account for her childhood against the African-American life in the South as the background. 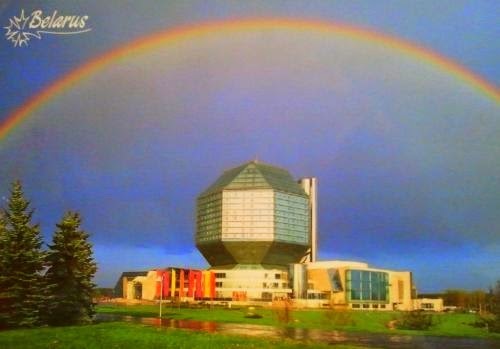 Postcard BY-892970 from Belarus shows a rainbow over the National Library in Minsk. Although unrelated, it does remind me a quote from Dr. Maya Angelou: "Try to be a rainbow in someone’s cloud." In "the Letter to My Daughter" in 2009, She said "You may not control all the events that happen to you, but you can decide not to be reduced by them." Dr. Maya Angelou recited her poem "On the Pulse of Morning" at President Bill Clinton's inauguration in 1993. I can't wait to see the stamp.